This article applies to System Center 2012 R2 Configuration Manager. For information on how to deploy Office 365 ProPlus with Configuration Manager version 1702 or later, see Deploy Office 365 ProPlus with System Center Configuration Manager (Current Branch). For example, you can control network bandwidth usage by placing the Office 365 ProPlus installation files on a distribution point within your organization's network, instead of having users install Office 365 ProPlus directly from the Internet. Keep in mind, however, that even if you're installing Office 365 ProPlus from a location within your network, the computer where Office 365 ProPlus is installed still needs access to the Internet to be able to active Office 365 ProPlus. To get started, download the Office Deployment Tool from the Microsoft Download Center to a shared folder on your organization's network. Then, use the Office Deployment Tool to download the Office 365 ProPlus installation files from the Internet to the same shared folder. Next, edit the configuration.xml, and review Configuration options for the Office Deployment Tool to decide how you want to install Office 365 ProPlus. The following example shows a configuration.xml that you can use to install the 32-bit, English version of Office 365 ProPlus. It's important that you don't include the SourcePath attribute in the Add section of your configuration.xml file. That's because Configuration Manager copies the installation files for an application into a folder under the Configuration Manager client cache folder, and the name of that subfolder is different for each computer. Because the folder name is different for each computer, you can't specify a SourcePath that will work for every computer that you're deploying Office 365 ProPlus to. Instead, leave out the SourcePath attribute. When a SourcePath isn't specified, the Office Deployment Tool automatically looks for the Office 365 ProPlus installation files in the same folder that the Office Deployment Tool is located. That's why we're including the Office Deployment Tool, the configuration.xml, and the Office 365 ProPlus installation files together in the same shared folder. The next step is to create an application in Configuration Manager. An application contains the files and information that Configuration Manager needs to deploy software to a user's computer. On the Home tab, in the Create group, choose ** Create Application**. On the Application Catalog page, provide the information that's appropriate for your environment, and then choose Next. On the Deployment Types page, choose Next. We'll add a deployment type later. On the Summary page, review the settings you've chosen, and then choose Next to create the application. An application in Configuration Manager must contain at least one deployment type. The deployment type contains the installation files for a software package as well as rules that specify when and how the software is deployed. The path of the shared folder that contains the Office Deployment Tool, your configuration.xml file, and the Office 365 ProPlus installation files that you downloaded from the Internet. For example, \\server1\share1. The command line that gets the Office Deployment Tool to start the installation of Office 365 ProPlus. A detection method, which Configuration Manager uses to determine if Office 365 ProPlus is already installed on the user's computer. Select the Office 365 ProPlus application, and then on the Home tab, in the Application group, choose ** Create Deployment Type**. In the Content location box, enter the network share where you put the Office Deployment Tool, your configuration.xml file, and the Office 365 ProPlus installation files that you downloaded from the Internet. 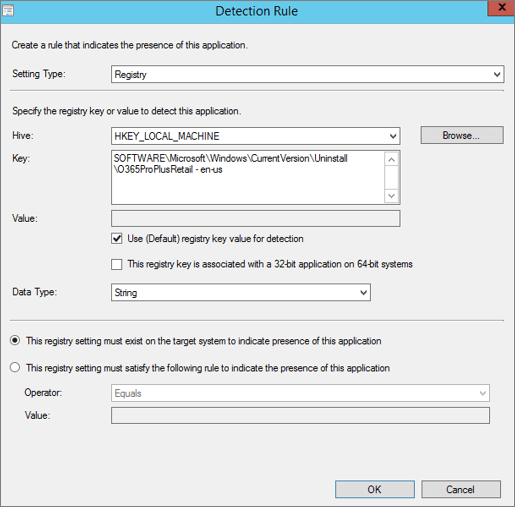 Select the Use (Default) registry key value for detection check box. On the Summary page, review the settings you've chosen, choose Next, and then choose Close. After you create the Office 365 ProPlus application and configure its deployment type, the next step is to copy all the files needed by the application to the appropriate distribution points in your Configuration Manager environment. Select the Office 365 ProPlus application, and then on the Home tab, in the Deployment group, choose ** Distribute Content**. On the General page of the Distribute Content Wizard, choose Next, and then on the Content page, choose Next. On the Content Destination page, choose Add > Distribution Point, select the appropriate distribution points, and then choose OK. Then, select Next. On the Summary page, review the settings you've chosen, and then choose Next. On the Confirmation page, check that the content was successfully assigned to the distribution points, and then choose Close. To monitor the distribution, go to Monitoring > Distribution Status > Content Status. Select the application, and then view the Completion Statistics. 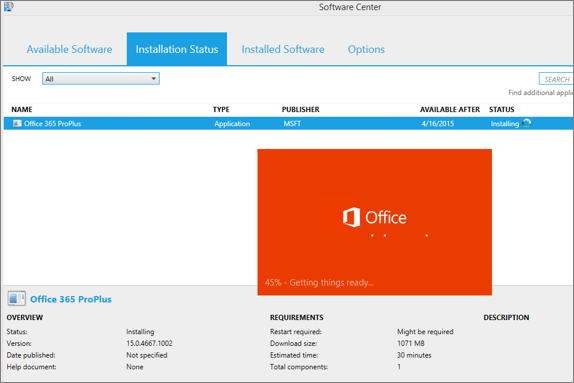 After the files for the Office 365 ProPlus application are copied to the appropriate distribution points, the next step is to deploy the application. When you deploy the application, you specify which computers or users get the application and when. Select the Office 365 ProPlus application, and then on the Home tab, in the Deployment group, choose Deploy. On the General page of the Deploy Software Wizard, choose Browse for the Collection box, and then select which computers or users that you want to deploy Office 365 ProPlus to. After you've made your selection, choose OK, and then choose Next. On the Content page, choose Next because we've already specified the distribution points for the application. On the Deployment Settings page, in the Purpose list, select Required. If you want to specify a schedule, configure the user experience, or create an alert, choose Next to go through those pages in the wizard. Otherwise, choose Summary. On the Confirmation page, check that the application was successfully deployed, and then choose Close. After you deploy the application, a targeted computer becomes aware of the deployed application during the computer's next client policy polling cycle, which is once every sixty minutes by default. Then, the computer downloads the installation files for the application from a distribution point into the Configuration Manager client cache. The installation of Office 365 ProPlus takes place from the client cache and no additional files are downloaded from the network or from the Internet.